When seconds count, you’d better have a way to defend yourself because no one else will be there to help. According to reports, it came down to a matter of life and death when a Kentucky woman was followed by a man in the mall. When she entered the garage elevator, as shown in the video below, the man followed behind. Neither of them said anything to each other and the woman knew instinctively what was about to happen. As soon as the elevator door opened she bolted for her car. The stalker, John Ganobick, gave chase. Surveillance cameras played in court this week from the Fourth Street Live food court show the chilling moment when Ganobick began to follow the woman. She told Louisville Metro Police she sensed instantly that she was being stalked. ‘The victim asked the suspect what floor he needed, and the victim described the suspect as being out of it, possibly high or drunk, but when he said the sixth floor, the victim stated she became nervous,’ states the police report read out in court. Appearing in court sporting a breathing tube that is a reminder of his injuries after the attempted attack, Ganobick has been charged with attempted murder, robbery and kidnapping. She told police when the elevator reached her floor, she started running to her car, but he chased her. The woman got in her car and he pushed in behind her and put his hand over her mouth, according to ABC 7. During the violent struggle the woman, who was being held at knife-point, reached into her purse and pulled out a gun. 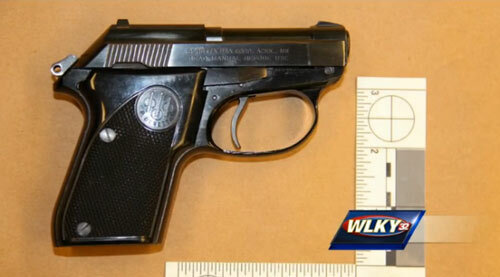 According to the woman she pulled the trigger, but the gun did not fire. So she kept on pulling the trigger till it did. He recoiled, but according to the woman, collected himself despite his injury and started to come towards her again. ‘The victim described being afraid that the suspect was turning to come back at her and she kept pulling and struck the suspect in the buttocks,’ states the police report. Surveillance footage captured the man coming down the parking garage’s stairs bleeding from the neck. Even this tiny, small caliber weapon was powerful enough to stop a predator from inflicting injury or death on his perceived prey. For those who would ban this woman from carrying a firearm to protect herself, we suggest considering what would have transpired had she not had a weapon to defend herself. Perhaps she would merely have been robbed. Or, she could well have been kidnapped, raped and murdered.